The U.S. Capitol, Washington, D.C.. The United States Congress is the national legislature of the United States of America. As established in Article I of the U.S. Constitution, it is a bicameral institution comprised of a Senate with two members for each state and a House of Representatives with seats allocated to each state based on its population. 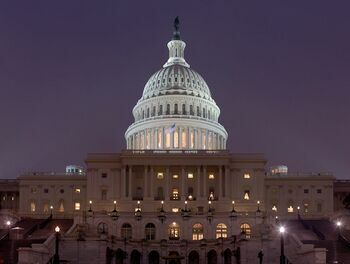 The Congress is headquartered in the Capitol Building in Washington, D.C. The precedent for a national legislature in the United States dates back to the end of the colonial period when, on September 5, 1774, 55 delegates from twelve of the thirteen colonies convened in Carpenter's Hall in Philadelphia to develop a coordinated response to Britain's closure of the Port of Boston after the Boston Tea Party. This First Continental Congress issued a "Declaration of Rights and Grievances" and called for a systematic boycott of British goods to add economic punch to their philosophical arguments for more home rule. The First Continental Congress also made plans to convene a Second Continental Congress, which gathered in May 1775. War had broken out and the Congress took control of the army, waged war, and negotiated treaties. It declared independence on July 4, 1776, creating a new nation, the "United States of America." The Third Continental Congress (1776-1781) drafted the Articles of Confederation in 1777; they were ratified in 1781. The Confederation Congress created by the Articles followed the same rules. Each state sent a delegation, which had one vote. Decisions required 9 votes (out of 13), and amendments had to be unanimous. Unable to levy taxes, it asked the states for money, printed paper money, and borrowed heavily. In the 1780s it convinced the states to give it their western lands, then started selling the lands to settlers. Its most notable legislation was the Northwest Ordinance of 1787, which created the Northwest Territory of the United States. Article I of the United States Constitution contains ten sections devoted to the Congress's institutional design and the scope of its powers. The Congress has two houses ("bicameral"), compared to the one-house ("unicameral") Continental Congress. Members vote as individuals rather than as states, except in rare cases involving presidential elections. The new House of Representatives gave states seats in proportion to their population (counting all the whites of all ages, and 3/5 of the slaves.) Each state has two senators. The U.S. Congress has significant power, tempered by the checks and balances provided by the executive and judiciary branches. This page was last modified 21:48, 5 August 2009.